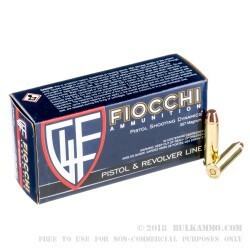 Fiocchi's CMJFP bullet is designed specifically for getting practice at the range. 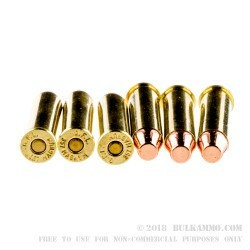 The Complete Metal Jacket bullet has no exposed lead at its base, reducing the shooter's exposure to lead, which is a benefit in indoor ranges. Furthermore, the flat-point creates highly visible splashes on paper, leaving no question as to where the round impacted. This makes it easy to get immediate feedback on your shot impacts. 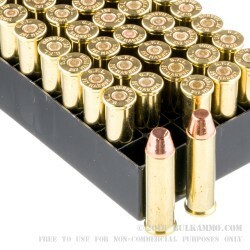 You won't have to waste time reeling your paper back in to see where you hit when these .357 Magnum CMJFP bullets leave big splashes on the paper down-range. 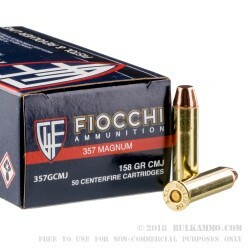 These 158 grain .357 Magnum CMJFP ammunition by Fiocchi produce 522 foot pounds of muzzle energy while traveling out of the barrel at 1,220 feet per second. Their boxer-primed brass can be reused safely. They come packaged in a plastic tray containing 50 rounds, wrapped in a beautifully decorated Fiocchi branded cardstock box.